Abstract: Based on the space-time continuum Minkowskis25, called “WORLD”, where according to Einstein11 the usual time coordinate is replaced by the imaginary magnitude , which has the dimension of a length, it is proposed, that our three dimensional space moves with the help of the time as tool like a slice through the four-dimensional WORLD. The time behind our space slice is our past, the time before this slice is our future. This four-dimensional WORLD is us well known as Period like the period of the 20th century, which means not only the time between 1900 and 2000, but also all changes of space during this time as for instance the destructions caused by both world wars or the invention of the automobile. However, we can only remember the past and try to forecast the future. But we can not change the past and we do not know exactly how our doing really will effect our future. We only will know it, when the future becomes for us the past. Our body, a three-dimensional creation, is situated in a likewise three-dimensional space, which additionally is exposed to a forth of gravity because of the pull of the earth (gravitation). Thus we divide the three dimensions of the space with our senses in width, depth and height. This organization applies however only relative to the location on earth and not relative to the cosmos. Both our body and the perceptible space change with time. In our memory however the past form remains and by our fantasy and presentiment we can design a future form (for example a house). Where however did the former form remain, where the future come from? What is the time? Augustinu4 admits: If nobody asks me for it, I know it; if I want to explain it to someone asking, I do not know it. The future is not yet, the past not anymore, therefore they both are not being. There is nothing on earth, which is not bound to time. Everything has its time (Koh 3.1). Where are future and past, Augustine4 asks. He does not know it, but knows however, where they are, they are neither future nor past, but present. The present, the now, is the border between future and past. It does not have time, is however being. For our consciousness it becomes perceptible, because we have the ability to experience up to 10 seconds of the past as simultaneous presence. But already the sight of an object at further distance shows us not the present, but the past: The sun, as it was approximately 8 minutes ago, the star Sirius, as it was approximately 9 years ago. That takes place by means of the fact that the light, which is perceptible with our eyes, has a finite speed. If a mirror would be situated on Sirius, in which we could watch ourselves, we would see ourselves not now in the present, but in the past many years younger. Aristotle2 determines (physics 4, 11, 220a): That thus the time is a measure of the movement regarding before and afterwards, and that it is coherent is obvious. Augustine4 (confessions, XI 27, 35-36) notices: What is it, which I measure there? Where is the short syllable, with which I want to measure, where is the long? ... Not the heard syllables themselves, which are not any more, are measured by myself. I measure something in my memory, which clings there as an impression. In you, my spirit, I measure the times... The impression, which is produced in you by the phenomena with their passing and which stays in you, if the features are past, that is it, what I measure as something present, not what passed there producing the impression. Thomas's von Aquin32 (S.th. I, 10.4 to 3) says: As the eternity is the actual measure of the being, then the time presents itself as the actual measure of the movement. Emanuel Kant21 (Cr. p. R., B50) wrote: The time is a condition a priori from all impression actually, the direct condition of the inside (our souls) and evenly by it indirectly also the outside (our body and the world) impressions. Isaac Newton26 explained: The absolute, real and mathematical time flows in itself and in its nature regular, without relation to anything beyond laying off it. It is called with an other designation duration. The absolute space, which exists on reason of its nature without relation to anything except to itself, remains itself always the same and motionless. What is space and time? Do both exist out of discrete parts, as Newton26 has described it or do they form a continuum according to Leibniz22? The Quantumtheory follows Newtons Idea. But the later one is only a description of the fact, which is valid for three- or more dimensional bodies in space and time. The dimensions of space and time themself form rather a continuum, in which everything, which we want to describe in physics, chemistry and mechanics takes place. Time can only be in the soul, only in there can past, present and future be kept apart and experienced. The soul is in the time. But the body of humans is in the three dimensional space. Besides the physical time, which is measured today by the duration of even oscillations (clocks) (Augustin4 as orator used for it the duration of syllables of the human voice), there are other kinds of times. To emphasize is the individual, psychological time. It is from person to person and from opportunity to opportunity of different duration: Some feel themselves early old, others remain eternaly young or are early growing up. Sometimes the time passes fast sometimes it lasts endlessly. Time is in the human spirit; it is the condition of the soul. The results, which were gained by the research in the areas of nuclear physics, quantum mechanics and cosmology, show that, besides the to us well known space dimensions point (zero dimensional), line (one dimensional), even (two-dimensional) and room (three-dimensional), still further space dimensions are existent. In the meantime, for the explanation of quantum-cosmological phenomena, higher-dimension areas are postulated, for example an eleven-dimensional space-time for the explanation of the Big Bang at the beginning of our four-dimensional space-time and the standardization of the three atomic forces (strong, weak and electromagnetic strength) with the force of gravity (Hawking16). The same applies to the opinion, our three-dimensional universe exists as diaphragm in a higher-dimensional area (Arkani Hamed et al3). The Non-mathematician is seized by a mysterious shuddering when he hears of “four-dimensional” things, by a feeling not unlike that awakened by thoughts of the occult. And yet there is no more commonplace statement than that the world in which we live is a four-dimensional space-time continuum. Similarly the world of physical phenomena which was briefly called “world” by Minkowski25i is naturally four-dimensional in the space-time sense. It is composed of individual events, each of which is described by four numbers, namely, three space coordinates x, y, z and a time coordinate, the time-value t.
Minkowskis25 important discovery for the formal development of the theory of relativity is to be found in the fact of his recognition, that the four-dimensional space-time continuum of the theory of relativity, in its most essential formal properties, shows a pronounced relationship to the three-dimensional continuum of Euclidean geometrical space. In order to give due prominence to this relationship, however, we must replace the usual time coordinate t by an imaginary magnitude proportional to it. Under these conditions, the natural laws satisfying the demands of the (special) theory of relativity assume mathematical forms, in which the time coordinate plays exactly the same role as the three space coordinates. Formally, these four coordinates correspond exactly to the three space coordinates in Euclidean geometry. It must be clear even to the non-mathematician that, as a consequence of this purely formal addition to our knowledge, the theory extraordinaraly gained clearness in no mean measure. Minkowskis WORLD25 made it possible for Albert Einstein11 to expand his special relativity theory to the general relativity theory. The relativity theory gives us a notion of the infinity of God, the origin of the soul and their continuation after death. In the relativity theory the time becomes flexible. By use of the imaginary number , which can also be written: `ict´ (whereby i is the indication of an imaginary number), results with time the fourth dimension of the spacetime. This forth dimension equivalently exchangeable with the three dimensions of our space in the four-dimensional WORLD. The time is an aid, with which we spacenatures, who live in a three-dimensional space, experience a further dimension, the future. It is the measure, with which we experience the for us imaginary WORLD of the fourth dimensions, the future and the past. That has Albert Einstein11 clearly described. The fourth dimension is naturally something real. However, it depends from where one regards the happening: In the four-dimensional WORLD (not accessible for us) the fourth dimension is real existing. With the three coordinates x, y, and z of the three-dimensional space, associates as the fourth coordinate , which may be called “w”. , which has the dimension of a length, is freely exchangeable with the other three coordinates. In the three-dimensional space however this fourth dimension w has an imaginary size, which develops for us with time and lets so develop the space-time, for us the imaginary four-dimensional WORLD. The time is the tool, with which we notice and feel the fourth dimension as past and future (Bader6,71995). One can clarify oneself experiencing the four-dimensional WORLD thereby, that one imagines a two-dimensional creature, whose living space is the plane with the coordinates x and y. The tow-dimensional nature can experience our three-dimensional space with the coordinates x, y and z only by the way, that it experiences the third dimension z of the space as an imaginary dimension with time. We will call this two-dimensional organism an evennature. A three-dimensional object is only then recognized by an evennature if it meets in its timeline this object. That is the temporal beginning of this object for the evennature. This object was before in the unknown future of the evennature. With the help of the time the evennature in its two-dimensional plane wanders through this three-dimensional object. The evennature recognizes this object not in its three-dimensional expansion, but only in each case as a two-dimensional cut through the object. If the timeline of the evennature leaves this object, it lies for the even nature in the past. For us spacenatures is this three-dimensional object with its coordinates x, y and z present in its whole expansion, even if we are outside of the time of the evennature, thus in its past or its future or “elsewhere”, therefore outside of its liveline. Insufficiently and roughly illustrated, the entire time-bound human in space-time (our life from the birth to death) can be compared with a loaf of bread, which is cut in slices and again built up from these slices (similarly as an imaginary two-dimensional evennature would experience our three-dimensional objects with the help of time). At each time we live only in a three-dimensional layer of the space-time (similar to a two-dimensional slice of bread in our space). The individual layers (our three-dimensional space) build themselves up with the time from beginning to end to an overall view, which we three-dimensional natures (space natures) recognize as the four-dimensional WORLD. The time makes it thereby possible for us, to experience the four dimensions of space-time, the WORLD, (similarly as the imaginary two-dimensional evennature the third dimension of bread would witness) and thus to fulfill our life. This experience happens with a certain speed, for which Minkowski25 used the term c, the speed of light. A conception of the four-dimensional space-time gave already Galileo13 in his dialogue (1st day, 117), where he describes the acquisition of knowledge: These transitions, for which our spirit uses time, which it carries out gradually, passages the divine intellect equal to one instant or, which means the same, they are him always present. The yesterday and the morning of our three-dimensional space are in the four-dimensional WORLD part of the today, they are simultaneous (Bader6). This world is the place, in which everything takes place, in what Husserl20 was engaged in his “Logic investigations” and what Heidegger18 expressed in “sense and time”. In the remembrance we can recall the way, which we covered in time (the fourth dimension), in our memory, for instance the years during our school time. In the future we mark out goals so we can reach them. The way there is the fourth dimension, which we will experience with help of time as tool. In a certain sense humans do not have a problem to convert the time in a length dimension for the sake of descriptiveness. This happens, if they want to plot an event graphicaly, for example the share quotation, There, in a Diagram (a two-dimensional plane), the respective share quotation is laid on the ordinate (a onedimensional line) and the pertinent time in the abscissa (likewise a onedimensional line). From such graphics, in which the time is represented as a linear dimension, the course of the share quotation is evident in the past. From it one can now imply the share quotation in the near future. This will lead hopefully to a positive conclusion of a deal. Since we do not know however the future reliably, but can only suspect it, we cannot be safe over the suspected future from the past (in this case of the share quotations). A further example results in the case of filming: If the father shoots his children with a movie camera while playing, he transfers the temporal happening of three-dimensional playing in the two dimensions of pictures on a filmstrip. The time is stored thereby as a linear line (the length of the filmstrip). When playing this strip the time appears again as a time dimension on the screen. The past is gotten into the present so to speak. According to the theory postulated by George Gamov14 and confirmed of by Steven Weinberg33, time and space resulted approximately 15 billion years ago from the so-called Big Bang. According to the usual view of the cosmology there was no time and no space (Stephen Hawking16,17) before the Big Bang. That applies reliably to our four-dimensional space-time, the WORLD, because before the Big Bang this WORLD was outside of our time coordinate and therefore, their was no space and time in this WORLD. This World, and according to that, space and time, are thought to have started by the explosion (Big Bang) of an infinitely small core, in which the entire energy of our universe was infinitely pressed together and developed by expansion like an explosion to its current size (Guth15). However, are therefore space and time inventions of the Big Bang? Are they not rather conditions of the infinity? Has not the time ignited in the Big Bang our presence with its three-dimensional space and leads from there on our three-dimensional space through our four-dimensional WORLD? Couldn't it be the fact that the entire energy of our four-dimensional space-time was always distributed over this WORLD but became only present for us at our time zero, at which point time stepped into our WORLD? The four-dimensional WORLD would then exist like in a Steady State - as Bond, Gold and Hoyle had suggested (Hawking16,17) -, which the three-dimensional space experiences with time (Bader6,7). That means, our universe did not develop from nothing, but from elemental powers, which were called in age-old creation stories of mankind darkness, Deluge, chaos, Tohuwabohu and other ones. One could imagine then the development and change of our three-dimensional space with time from the Big Bang up to now and further into the future formally like a two-dimensional plane, which moves with time through a three-dimensional ball or a three-dimensional hyperboloid. At the beginning of our time (the Big Bang, approximately 15 billion years ago) our three-dimensional space would have begun by the entrance of the time as a point on the surface of the four-dimensional WORLD and is moved from this point as a three-dimensional space-slice (brane, Randall28) continuously with the help of time like a cut through the four-dimensional WORLD. Because of its spherical shape our space did experience at the beginning a sudden expansion out of nothing, the Big Bang. With time the expansion became ever slower when wandering through the four-dimensional WORLD. If the four-dimensional WORLD possesses actually ball-similar shape, finally a contraction of the three-dimensional space would take place up to the nothing. The reverse Big Bang, the collapse, would happen by leaving the four-dimensional WORLD. If the four-dimensional WORLD possesses however a shape similar to a hyperboloid, an always larger expansion up to the final dilution would take place. This would come the present knowledge nearest (Freedman12). The three-dimensional time-slice, in which we live, is by the speed of the light not even, but bend into the past. The further we look with a telescope, the further the event lays back in the past. Because of the final speed of the light we will never see the presents, thus things as the are simultaneously, but always as the were in the past. The four-dimensional WORLD is already for a long time familiar to us as Period. We speak of a period, if we mean for example a certain time in past history, like the time of baroque. This period covers roughly the development of the three-dimensional space in the years of the 18th century with all events and space changes during this time. This period is thus four-dimensional. Also, the period, which we name for example midday of 12 o'clock to 13 o'clock and in which we have three-dimensionally lunch, is four-dimensionally. And like that the whole period of our life is four-dimensional. The term period is called in German “Zeitraum”, which is, translated into English word by word: “Timespace”. And this term describes exactly what it means: The four-dimensional space, in which we accomplish our life, the WORLD, as we know it, began through the time. We experience the development of our WORLD from the beginning to today and into the future with time (Augustine5, God state, XI, 6). We humans however live in this WORLD in the time. Here the question emerges whether with traversing of such a four-dimensional WORLD everything that happens in the three-dimensional space is already predetermined or whether humans possess by strength of their soul, given by God, the possibility of forming the WORLD. Maimonides23 means to that: The answer to this question is longer as the measure of the earth and more broadly than the sea. Is the fourdimensional WORLD the place, at which the dark mass and the dark energy (which constitute the larger part of our universe) is situated and which influences from there our three dimensional space? God gave humans with their will the possibility to arrange (to change) the process of their life and concomitantly the future of the WORLD. Similarly as the farmer ploughs into his field furrows and thereby changes by his work the field according to his will to his favour, humans are created by God to administer the WORLD. Times form us, while we form the world. Freely moving, the will is nevertheless at the same time moved by another: it resembles a passenger of a ship, who can spend its days freely in hundred fold changing resolutions and actions, whereas he moves nevertheless in the course of the ship. Freely hustle humans themselves at board of the necessity (Bernhart8). From the possibilities of the present the reality of the future develops through us with the help of time. But then however this future is already again the past (similar to the wave particle dualism of the quantum theory, Peter Pasic27. Time itself is a yardstick, which does not disappear simply when one experiences the four-dimensional space-time, but will exist further on in the four-dimensional WORLD. It serves as tool, with which the experience of a higher-dimension of space is made possible. The fourth dimension of the WORLD, which is a length dimension as the remaining already existing three dimensions of the space, does not develop from the time, but by the time. As one can imagine a four-dimensional space, in which the three-dimensional space gains through the time the fourth space dimension (Minkowskis25 WORLD), one can imagine that the four-dimensional time-space experiences the fifth dimension again with the help of the time and ever higher dimensions, until one comes finally to the infinitely dimensional space (figure). One can call this infinitely dimensional space ALL. There cannot be a further space dimension, thus also no movement and no time to experience. One can express the disappearing of the time in the infinitely dimensional space mathematically by introducing a factor, which divides the time by the number of given space dimensions. So the time disappears in the infinite-dimensional space. 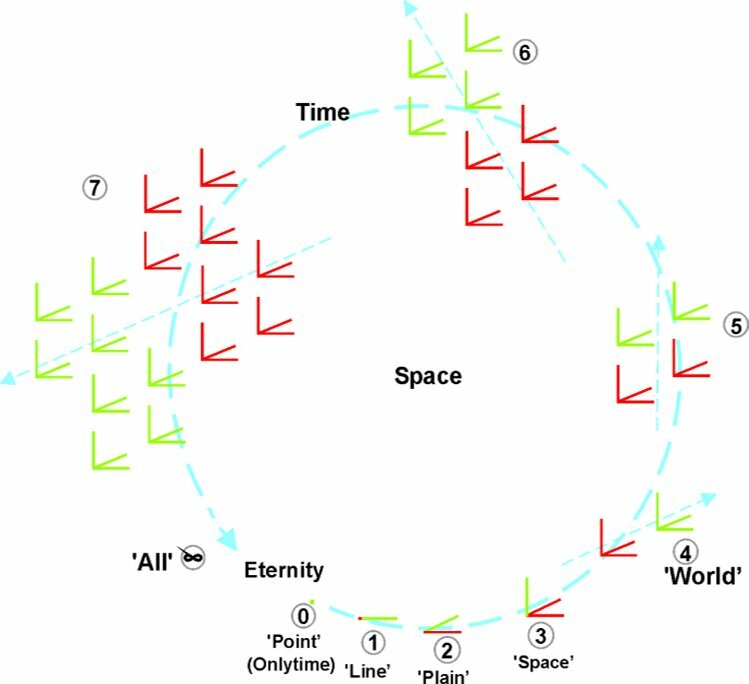 Figure: PLERWA (space dimensions and time). Red: original dimensions of a space. Green: Additionally dimensions experienced with time. Blue: Time, with which the additional dimension is experienced. Numbers: Dimensions of the spaces from zero to infinite. Likewise one can imagine a space with fewer dimensions than our three-dimensional space. In a two-dimensional space (even-space) the third dimension of our space becomes time (Abbott1 and Stewart29). This resembles the tomography in medicine, by which the physican divides the three-dimensional body (like the body of humans) with the time into two-dimensional layers. One can build these two-dimensional layers up again with time by computer treatment to a three-dimensional form, so, if arranged with correct selection, the organs of humans (for example the heart or the brain), can be looked at in their three-dimensional form and examined, without hurting the body of the human. In contrast to the tomography of the physician, which runs discontinuously, timing takes place continuously. The time of yesterday does not move towards today and further towards tomorrow. Rather the time moves us with the three-dimensional space through the four-dimensional world. The time is the basis of physics and concomitantly of technology. Mathematics uses the time for the description of phenomena, philosophy strives around the meaning of the time for humans and theology tries finally to understand the origin of the time and thus its Creator (God). So has the last reason of things to lie in a necessary substance, in which the special quality of the alteration is contained only greater as in a well, and this we name god. Since this substance is, whilst it is a sufficient reason for everybody, moreover universally connected, there is only one god, and this god is sufficient (Leibniz22). The highest God is the eternal, infinite and absolute perfect being; ….. He is not the “eternity” and the “infinity”, but he is himself eternal infinite; he is not “the Time” and “the Space”; but he himself lasts and is here. He lasts for ever and is omnipresent; and therefore, that he is always and everywhere, he causes the Space and the Time to the existence (Isaac Newton26). One can continue now to the linear space (line-space) and finally to the zero-dimensional space (point-space). In the point-space no space dimension exist but only time, spaceless ONLY-TIME. At both ends of our space-time we have thus the infinity, either the condition with infinite space dimensions without time, the ALL (“their is the time in a present now”, Meister Eckhart24), or the condition with infinite ONLY-TIME without space dimensions. One can call it according to the age-old designation of beginning and end of the life alpha (ONLYTIME) and omega (ALL). That leads finally to the realization that space and time are inseparable parts of eternity. One can further cut our three-dimensional space into infinitely many levels (smooth or curved). However, this means, as the three-dimensional space has infinitely many levels (two-dimensional spaces), the four-dimensional WORLD Minkowskis25 has infinitely many three-dimensional spaces. Hence it follows that the infinite-dimensional UNIVERSE must have infinitely many WORLDS. The additional space dimensions up to the infinite-dimensional ALL, described here, are not, as with the string theory of the cosmology (Hawking16,17), in threads rolled up dimensions (so-called strings) (Randall28), which are attached to the four-dimensional timespace. They are rather dimensions, which are equal to the three dimensions of our three-dimensional space and exchangeable with them. We cannot recognize them however, since they are for us in the past or the future. Minkowskis25 fourth dimension is characterized by an imaginary number. Therefore we cannot notice them with our senses, which are part of our three-dimensional body, but we can separate them only with our understanding, which is part of the soul. This is called usually the sixth sense. Here one could ask, if the dark matter and the dark energy (David B. Cline9), which contain obviously a multiple of the known mass of the protons, but are only detectable by their gravity, may be part of Minkowskis25 four-dimensional WORLD or further more-dimensional spaces. One could call the point, line, even, room, world and all, which result through the time and which are perceptible with our senses and recognizable with our understanding, according to their initial letters: PLERWA. This expression sounds similar to the old-Greek word Pleroma (plerwma), which means abundance or perfection and which Theilhard de Chardin30,31 called: the mysterious result of the fulfillment and completion for the absolute being, God, the eternal being himself. These considerations at space and time raise reliably more questions than they can solve. What lies between four-dimensional time-space and the infinite dimensional eternity? Is that the space, in which exists, what we call purgatory (1 Kor 3.13-15) or hell (Mt 25.41)? Is that the space, in which the angels (Luk 20.36) or the extraterrestrials live? Where do we find the prince of the darkness (the devil, John 14.30)? Where is the haven (Mt 5.16) to be arranged? Are the revelation of John, the visions of Hildegard of Bingen19, or the divine comedy of Dante10 to assign to the time-space between our habitat and the eternity? Should there be natures in the four-dimensional WORLD, nothing would speak against it that these natures have a free will at least comparably to that of us humans. These questions are naturally insignificant, if one denies the existence of God from the beginning. What, however, do then the more-dimensional spaces, which result from the advancement of the four-dimensional time-space and which are inaccessible for humans during their life, stand for? Who is where? Do the events in the Big Bang, the cosmology or the quantum theory run off from the multidimensional space-times described here? The solution of the mystery of the life in space and time lies outside from space and time (Wittgenstein34). Humans control the space, the time however prevail over humans. There are time and space, which unite organically, in order to weave the world-material with one another (Teilhard de Chardin28). The ideas over the PLERWA (the four-dimensional world and the infinite-dimensional universe resulting from it) developed here naturally do not claim, to explain any physical, chemical or biological problems, which run off in the three-dimensional space and the four-dimensional space-time and which we can experience and investigate consciously. Rather the framework shall be pointed out, within which all these things occur and happen, just so the realm of God. The PLERWA is what humans call according to their religion or their customs heaven, paradise, eternity, Brahman, Pantheon, the other world, all (infinitely dimensional UNIVERSE) or nothing (zero-dimensional ONLY-TIME). Our three-dimensional real universe is the nutshell in the four-dimensional, for us imaginary WORLD, of which Stephen Hawking17 speaks, if he quotes Shakespeare (Hamlet): God, I could be bound in a nutshell and count myself a king of infinite space. Abbott, Edwin: Flatland. Signet Classic 1984. Aristotle: Physics. Oxford Paperbacks 1999. Arkani-Hamed, Nima; Dimopoulos, Savas und Dvali, Georgi: Die unsichtbaren Dimensionen des Universums. Spektrum der Wissenschaft, Heft 10(2000)44-51. Bader, Hermann: Seele Raum Zeit. Christ in der Gegenwart, Jahrgang 47(1995) Seite 5-6. Bader, Hermann: Eine Anatomie der Seele. www.baderbuch.de 2003. Bernhart, Joseph: Chaos und Dämonie. Anton H. Konrad Verlag, Weißenhorn, 1988. Cline, David B: Sources and Detection of Dark Matter and Dark Energy in the Universe. Springer Verlag, 2001. Dante, Alighieri: Die göttliche Komödie. Weltbild Verlag, Augsburg 1994. Einstein, Albert: Relativity. The Special and General Theory. Bartleby.Com, New York 2000. Freedman, Wendy: Das expandierende Universum. Spektrum der Wissenschaft, Heft 6(2003)46-54. Galileo Galilei: Dialog. Verlag B. G. Teubner, Stuttgart, 1982. Hawking, Stephen: A Brief History of Time. Bantam Books, New York 1988. Hawking, Stephen: The Univers in a Nutshell, Bantam Books, New York 2001. Heidegger Martin: Sein und Zeit, 18. Auflage, Max Niemeyer Verlag, Tübingen 2001. Hildegard von Bingen: Scivias - Wisse die Wege. Herder, Freiburg, 1992. Husserl Edmund: Logische Untersuchungen. Max Niemeyer Verlag Tübingen 7. Auflage 1993. Leibniz, G. W.: Monadology - §§ 38 and 39, an edition for students, translated by Nicholas Rescher, University of Pittsbourgh Press 1982. Maimonides, Moses: Das Buch der Erkenntnis. Akademie Verlag 1994. Randall Lisa: Warped Passages. Ecco, Harper Collins Publishers, New York, 2005. Theilhard de Chardin, Pierre: Der Mensch im Kosmos. C. H. Beck, München, 1959. Theilhard de Chardin, Pierre: Das Herz der Materie. Benziger Verlag, Zürich 1999. Thomas Aquinas: Summa Theologica. Thomas More Publishing. Weinberg, Steven: The first three Minutes. Basic Books Inc. New York 1977.